The blue side or upper half of the light spectrum. These frequencies pertain to chemical activity or chemism. Blue light stimulates chemical activity which is why blue light is not used in photo processing dark rooms. The Ultraviolet frequencies, at the extreme upper end of the blue frequencies, accelerate chemical dissociation and are used (among many other uses) to dissolve plastics in photo plate making. 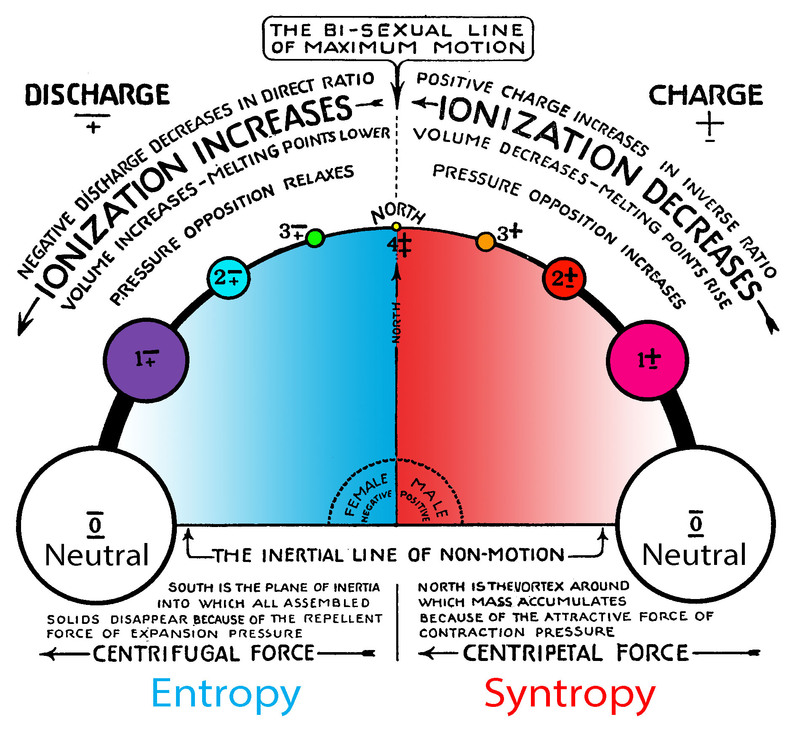 In function blue is the enharmonic, entropy, dispersion side of the spectrum. Blue has always been the color of the spirit, the symbol of contemplation, prayer, and heaven. The sky is blue because gas molecules in the air cause light rays from the sun to be scattered. This is the scientific explanation but, as I have mentioned before, blue is said to be the true color of the sun, and it is also the color of the planet Jupiter, which is the ruler of great thoughts and high-mindedness. Almost any kind of blue is good, but the deeper shades are the best. Pale blue indicates little depth, but a struggle toward maturity. The person may not be talented, but he tries. He will have many heartaches and many headaches, but he will keep going in the right direction. The middle blue, or aqua, belongs to a person who will work harder and get more done than the fellow with the light blue, though there may be little difference between them in talent. Those with the deep blue have found their work and are immersed in it. They are apt to be moody and are almost always unusual persons, but they have a mission and they steadfastly go about fulfilling it. They are spiritual-minded for the most part, and their life is dedicated to an unselfish cause, such as science, art, or social service. I have seen many Sisters of Mercy with this dark blue, and many writers and singers also. "The great unexplained mystery of melting points is the fact that the red side of the carbon octave reaches high melting points because of the fact that two of them are dense solids. On the blue side all three are gases and have melting points as low as 223 degrees below zero. Fluorine reaches this point while its mate on the red side, which is lithium, reaches 186 degrees above zero.